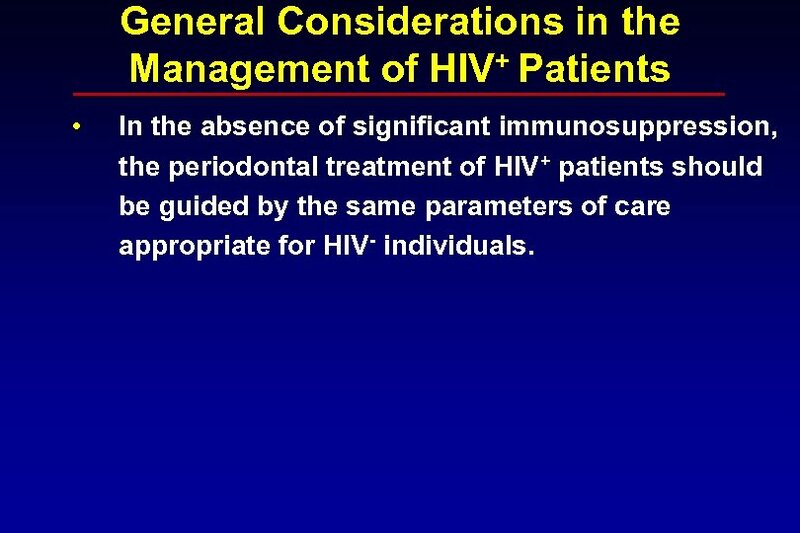 General Considerations in the Management of HIV+ Patients • In the absence of significant immunosuppression, the periodontal treatment of HIV+ patients should be guided by the same parameters of care appropriate for HIV- individuals. 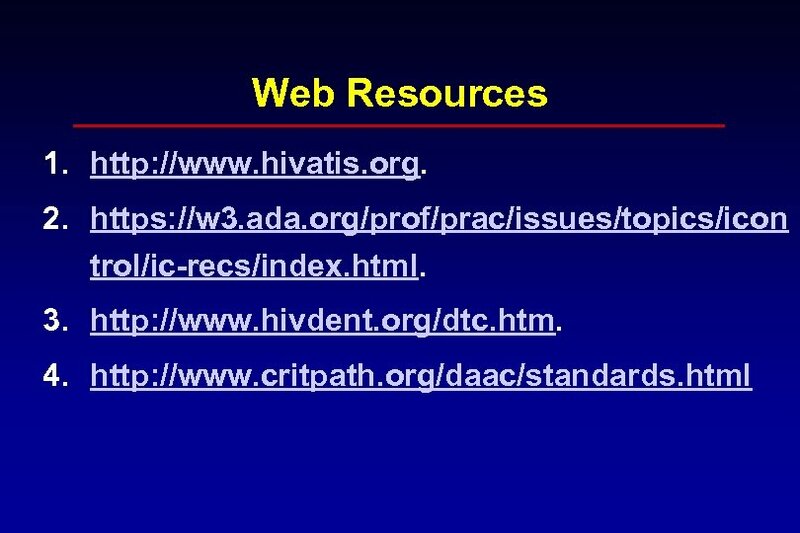 References • Classification and diagnostic criteria for oral lesions in HIV infection. 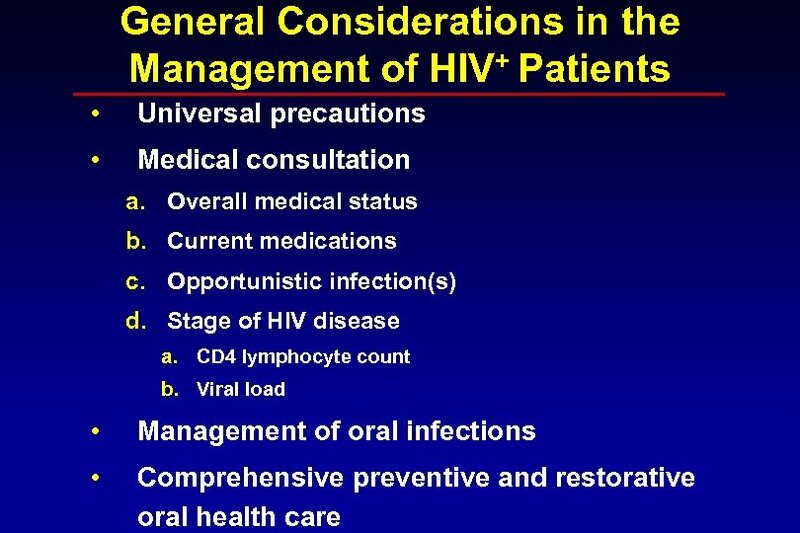 ECClearinghouse on Oral Problems Related to HIV Infection and WHO Collaborating Centre on Oral Manifestations of the Immunodeficiency Virus. 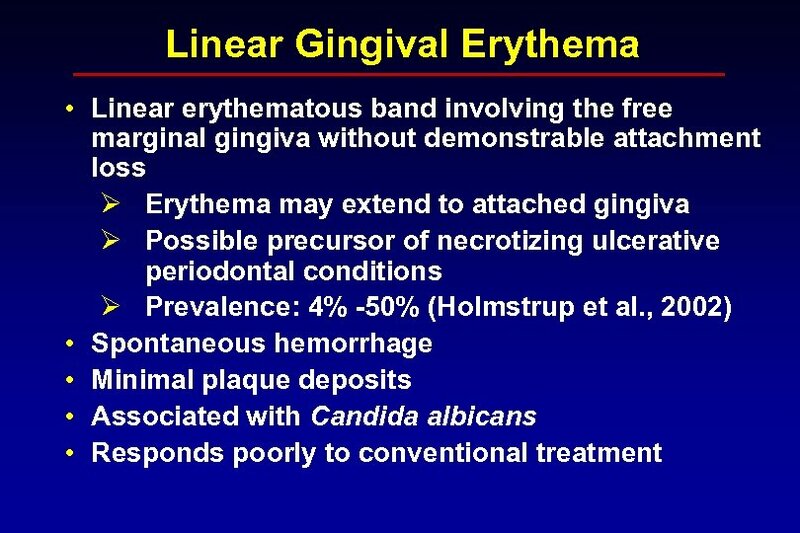 Oral Pathol Med 1993; 22: 289 -91. • Fauci, AS. 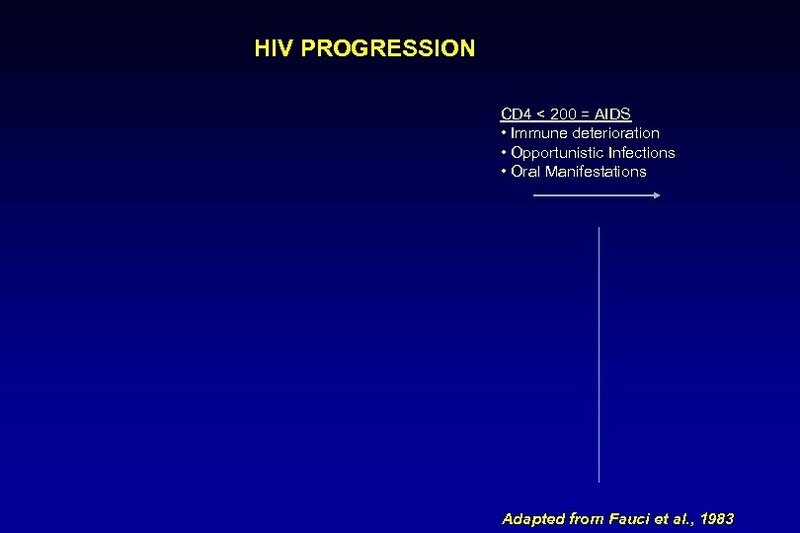 The acquired immune deficiency syndrome. 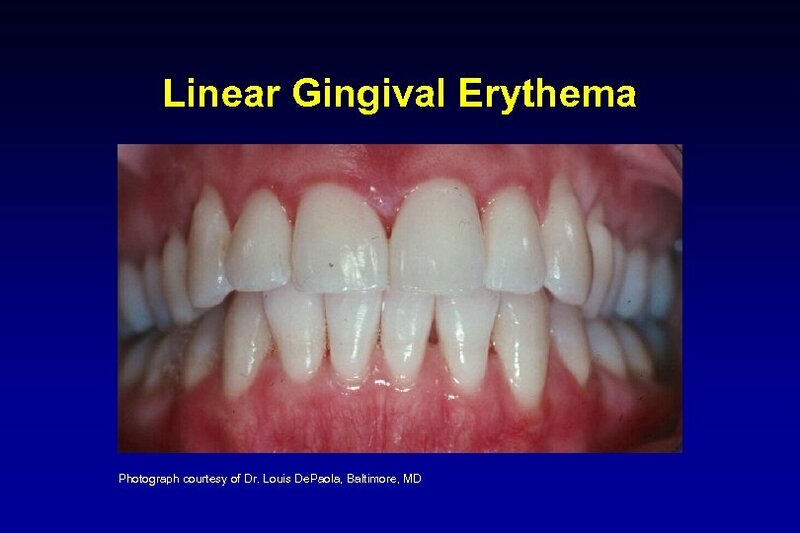 The everbroadening clinical spectrum. JAMA 1983 May 6; 249: 2375 -6. 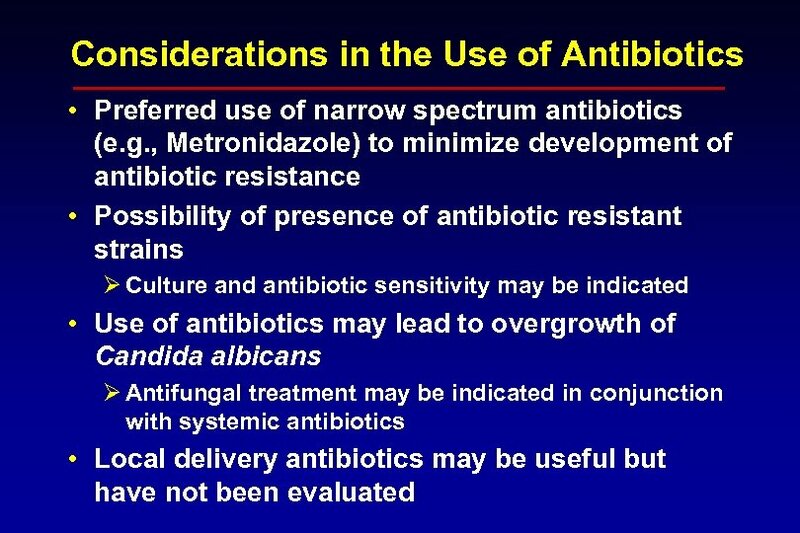 • Glick, M. , et al. 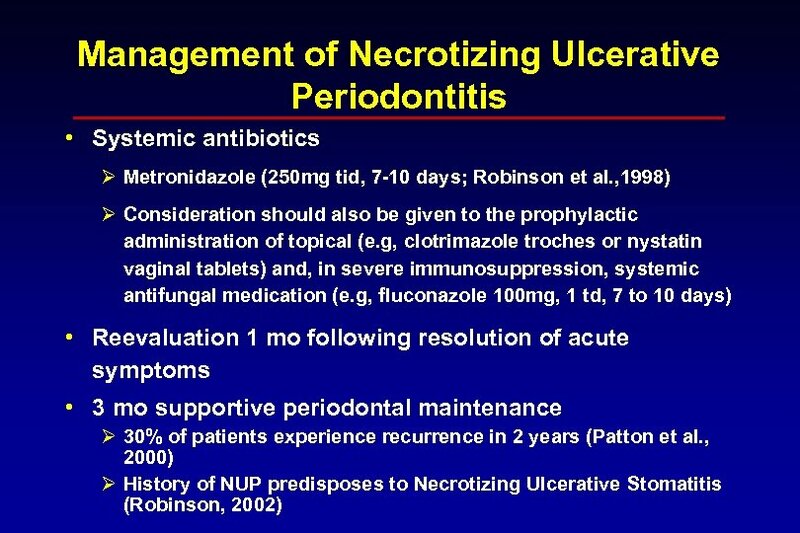 Necrotizing ulcerative periodontitis: a marker for immune deterioration and a predictor for the diagnosis of AIDS. 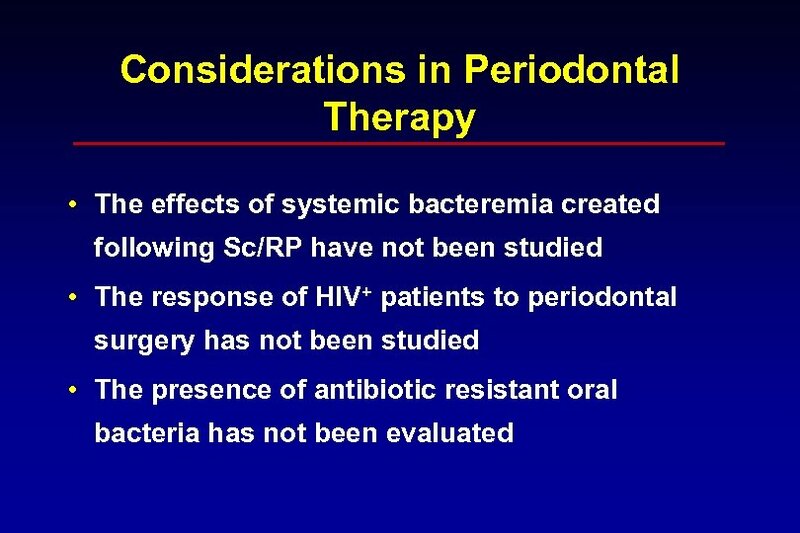 J Periodontol 1994; 65: 393 -397. • Greenspan, JS. 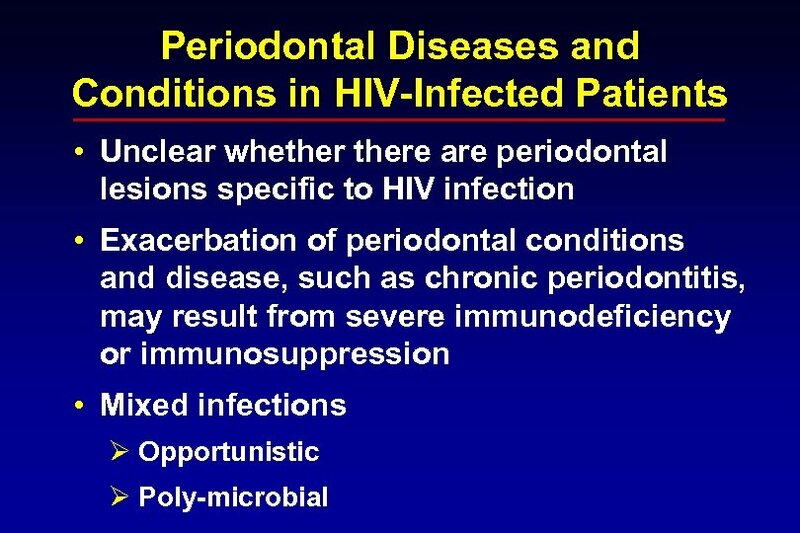 Periodontal complications of HIV infection. Compend Suppl 1994; 18: S 694 -8. • Greenspan D. , Canchola A. , Mac. Phail C, Cheikh B, Greenspan J. 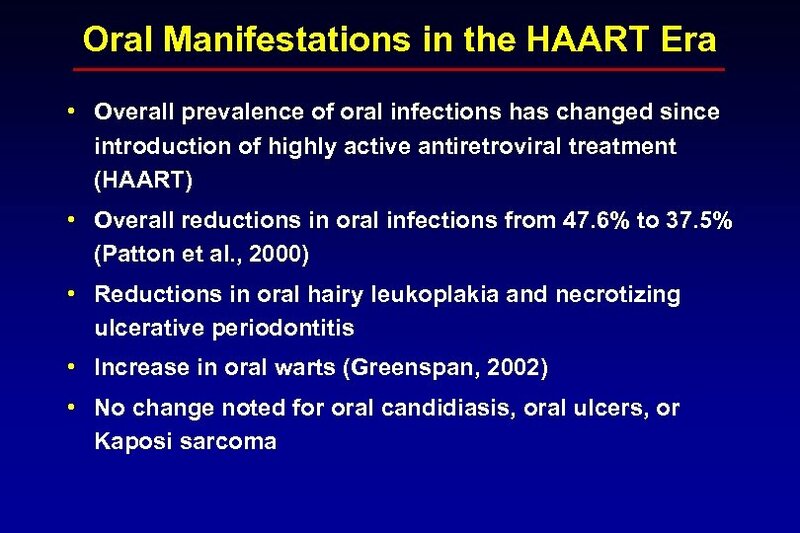 Effect of Highly Active Antiretroviral Therapy on Frequency of Oral Warts. 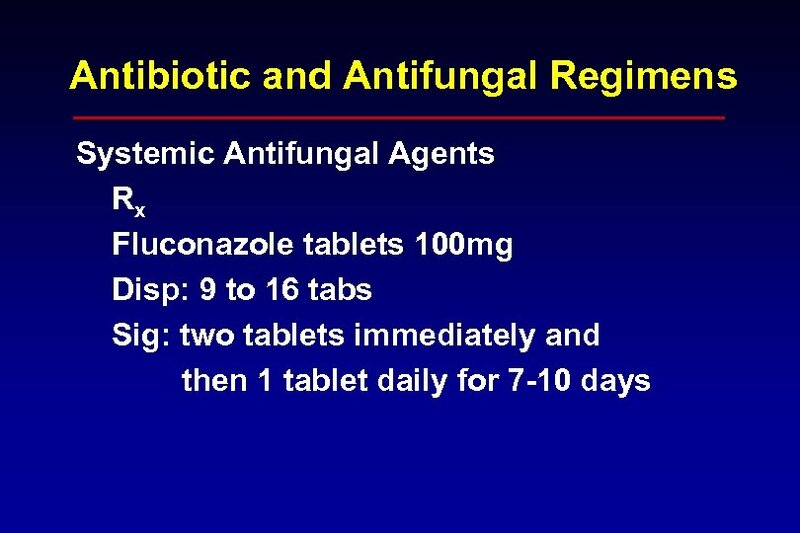 Lancet 2002; 357: 1411 -1412. 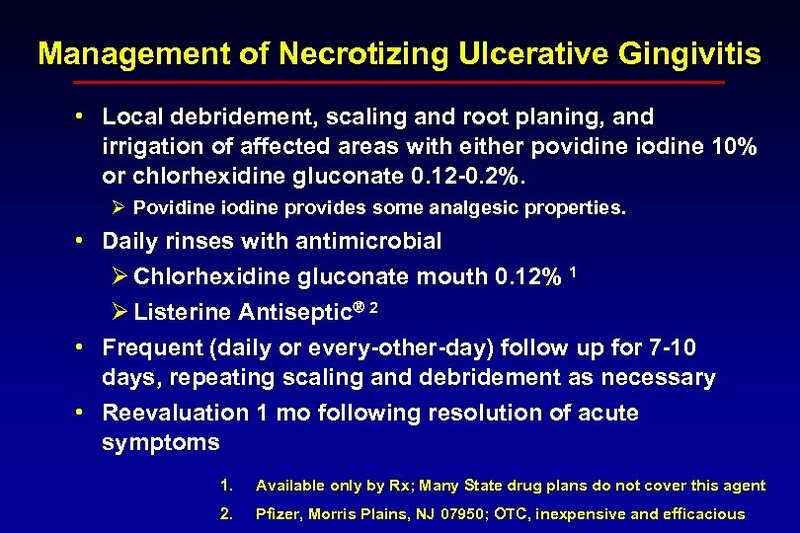 • Horning, GM Necotizing gingivostomatitis: NUG to noma. 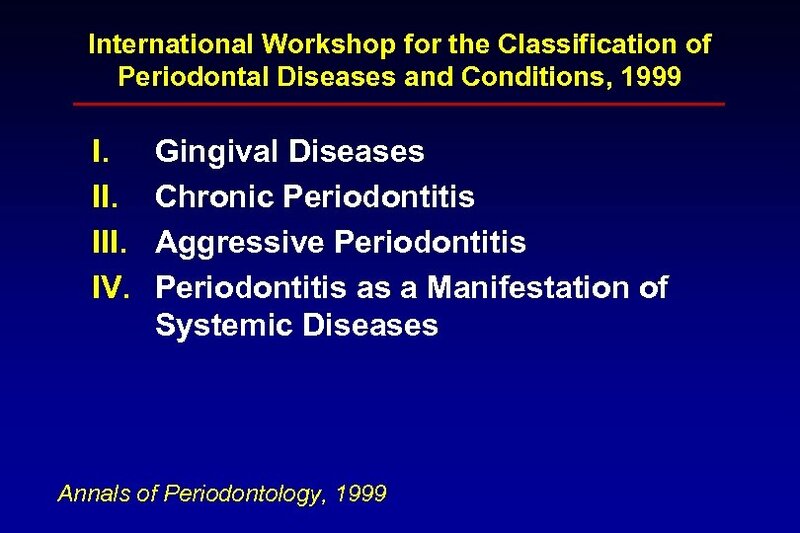 Compend Contin Educ Dent 1996; 17: 951 -4, 956, 957 -8 • Holmstrup, P. and Glick, M. Treatment of periodontal disease in the immunodeficient patient. 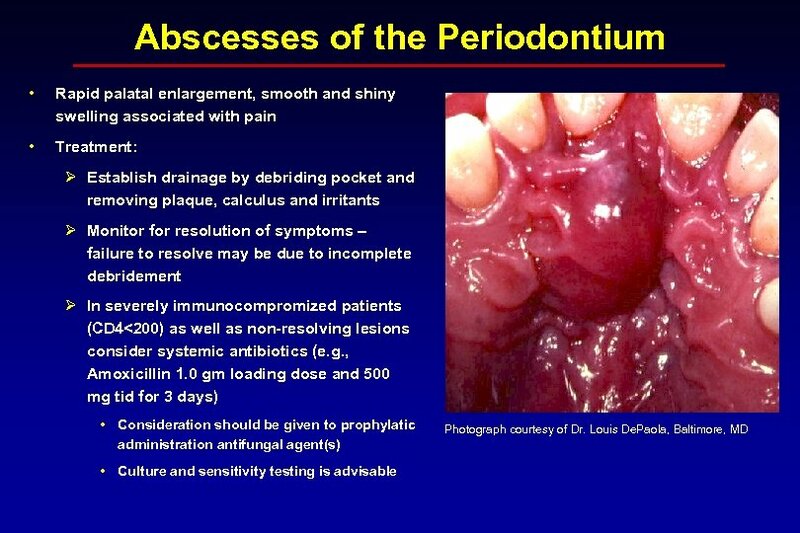 Periodontol 2000. 2002; 28: 190 -205. 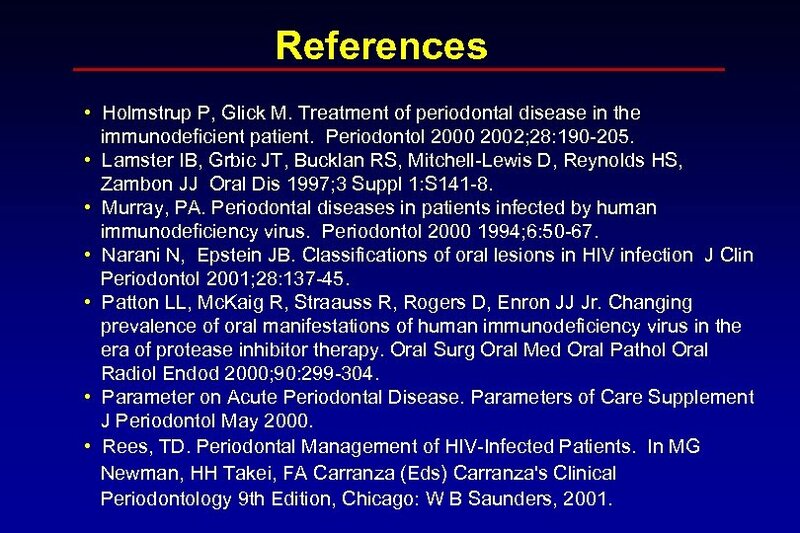 References • Holmstrup P, Glick M. Treatment of periodontal disease in the immunodeficient patient. 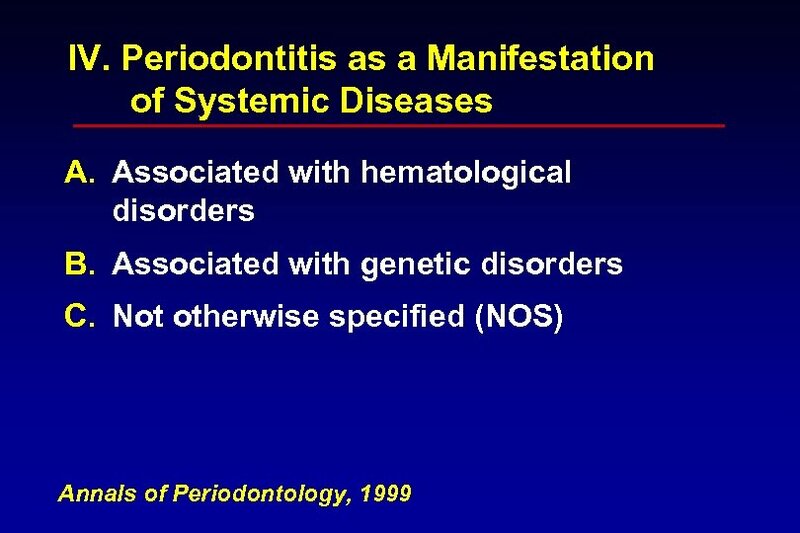 Periodontol 2000 2002; 28: 190 -205. 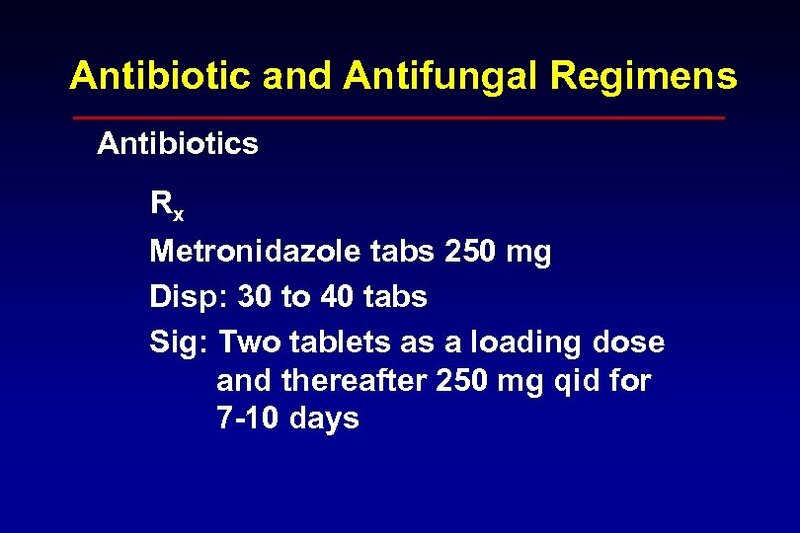 • Lamster IB, Grbic JT, Bucklan RS, Mitchell-Lewis D, Reynolds HS, Zambon JJ Oral Dis 1997; 3 Suppl 1: S 141 -8. 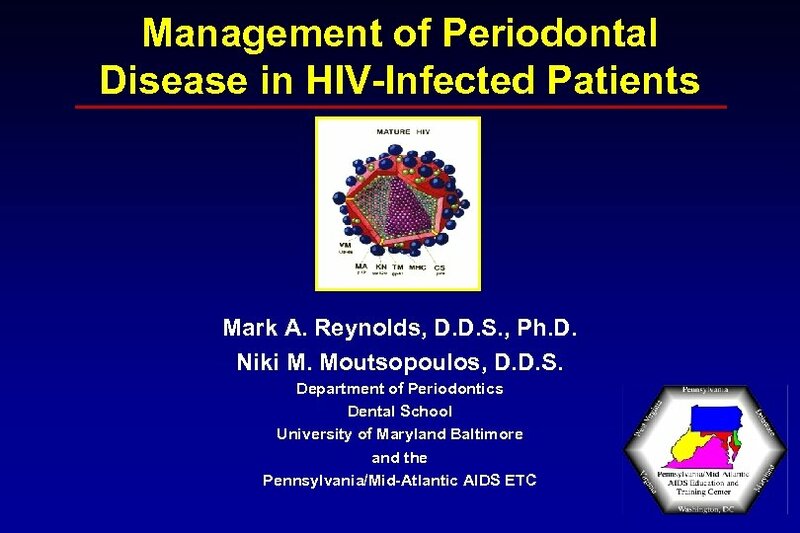 • Murray, PA. Periodontal diseases in patients infected by human immunodeficiency virus. 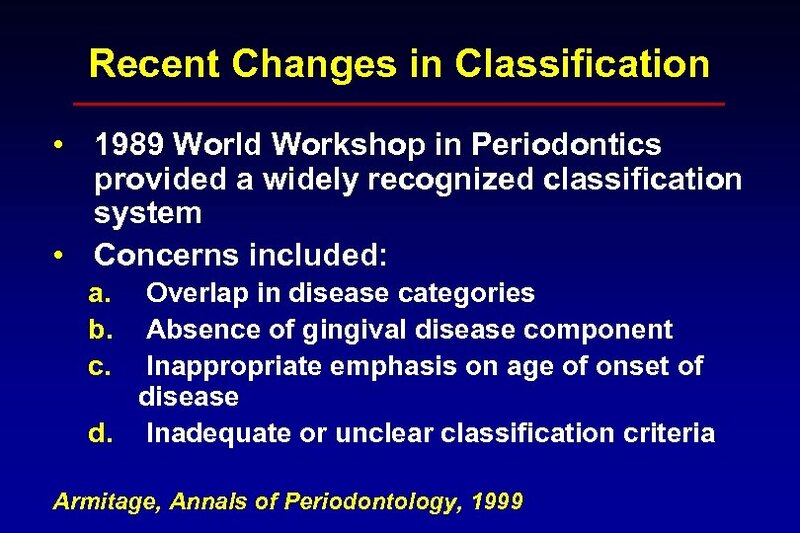 Periodontol 2000 1994; 6: 50 -67. • Narani N, Epstein JB. 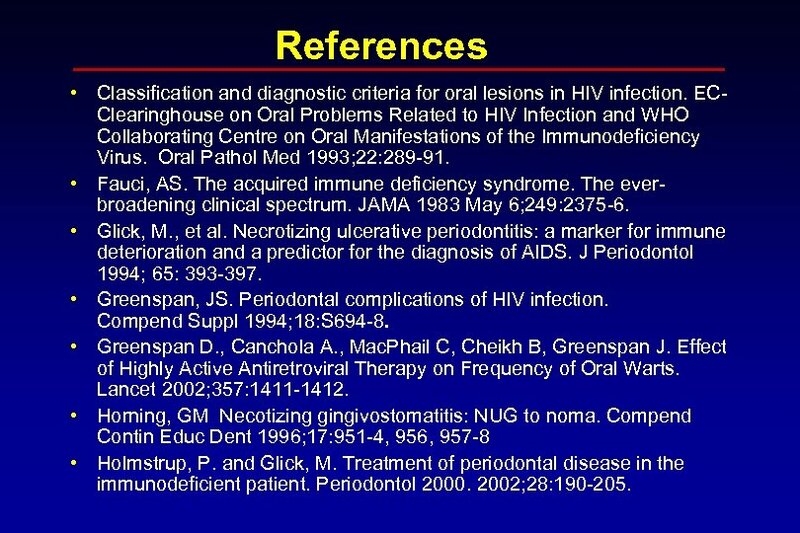 Classifications of oral lesions in HIV infection J Clin Periodontol 2001; 28: 137 -45. • Patton LL, Mc. 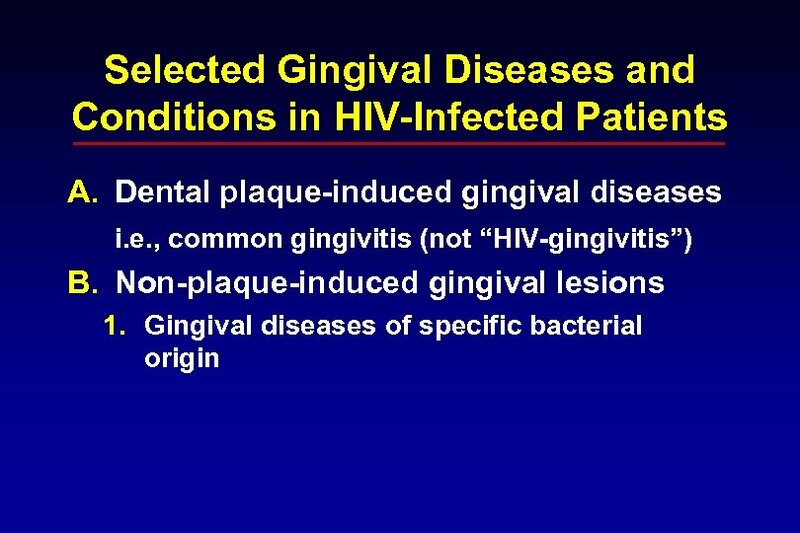 Kaig R, Straauss R, Rogers D, Enron JJ Jr. Changing prevalence of oral manifestations of human immunodeficiency virus in the era of protease inhibitor therapy. 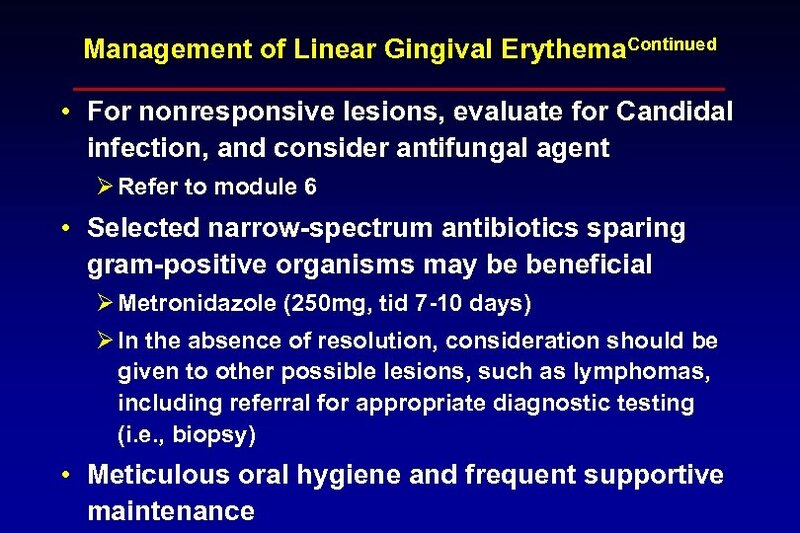 Oral Surg Oral Med Oral Pathol Oral Radiol Endod 2000; 90: 299 -304. 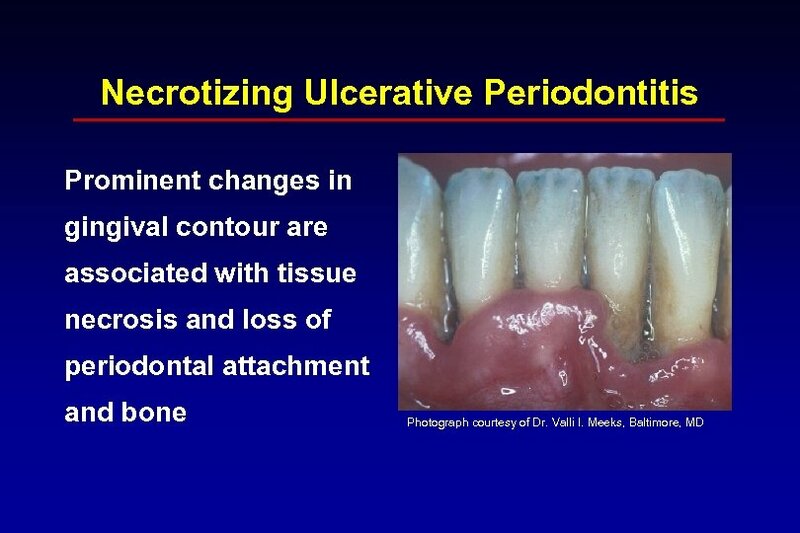 • Parameter on Acute Periodontal Disease. 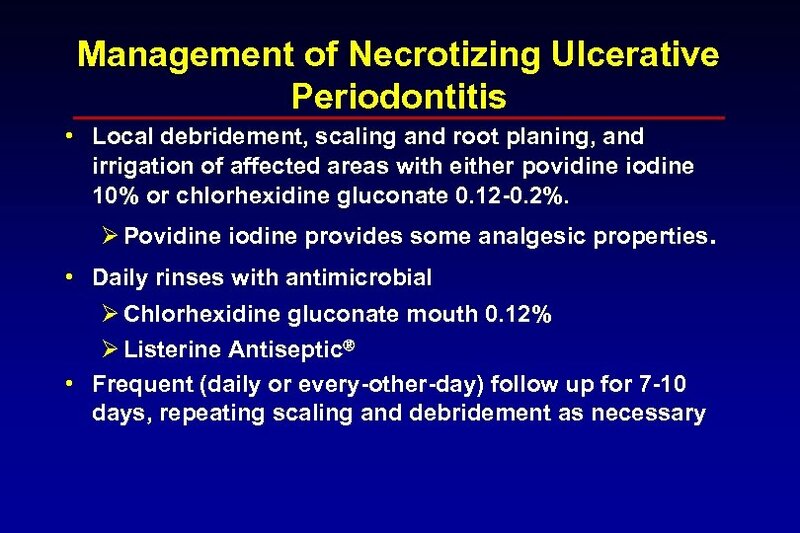 Parameters of Care Supplement J Periodontol May 2000. • Rees, TD. 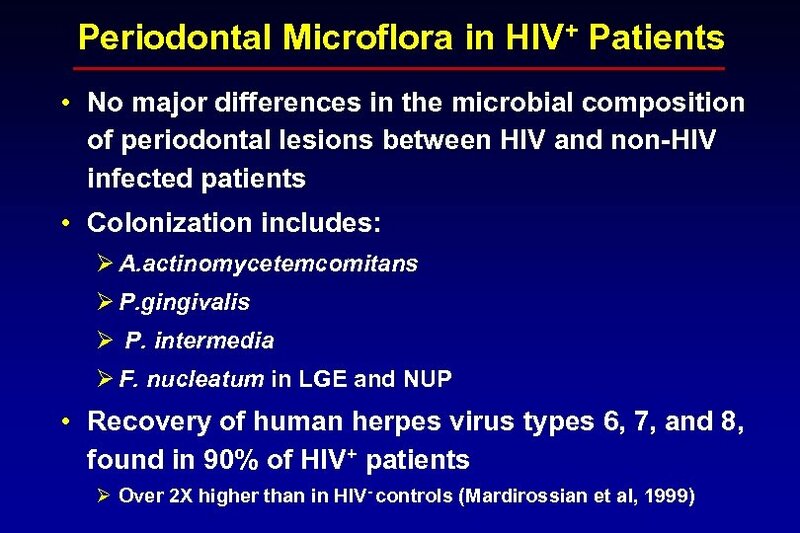 Periodontal Management of HIV-Infected Patients. 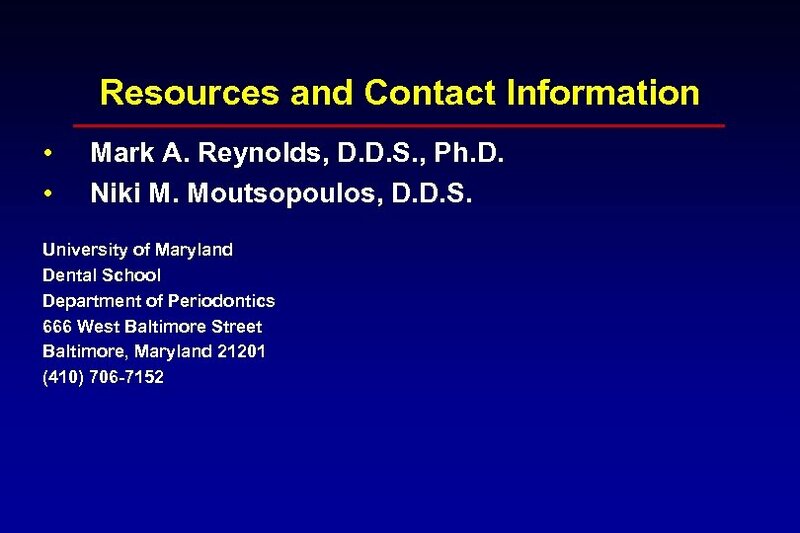 In MG Newman, HH Takei, FA Carranza (Eds) Carranza's Clinical Periodontology 9 th Edition, Chicago: W B Saunders, 2001. References • Robinson PG, Sheiham A, Challacombe SJ, Wren MW, Zakrzewska JM. 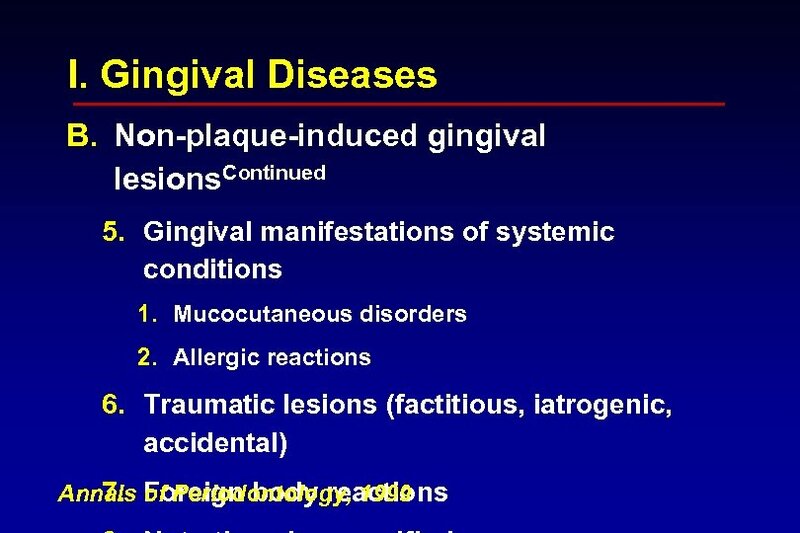 Gingival ulceration in HIV infection. 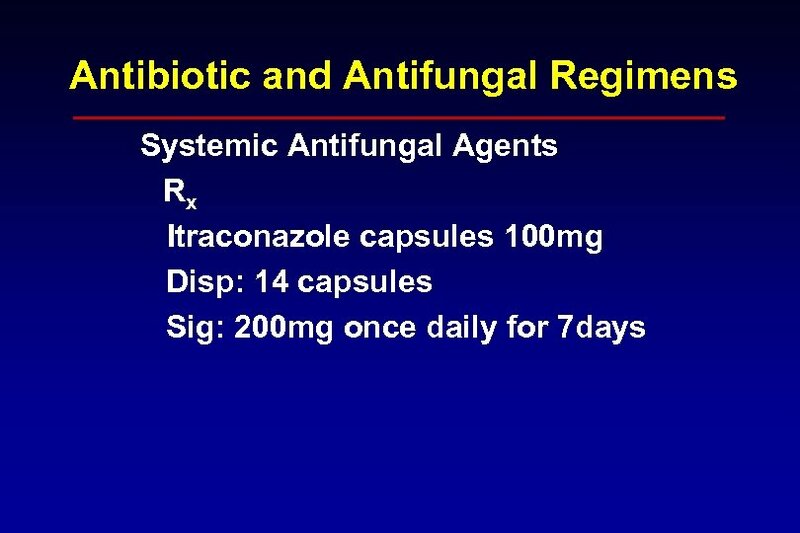 A case series and case control. study. 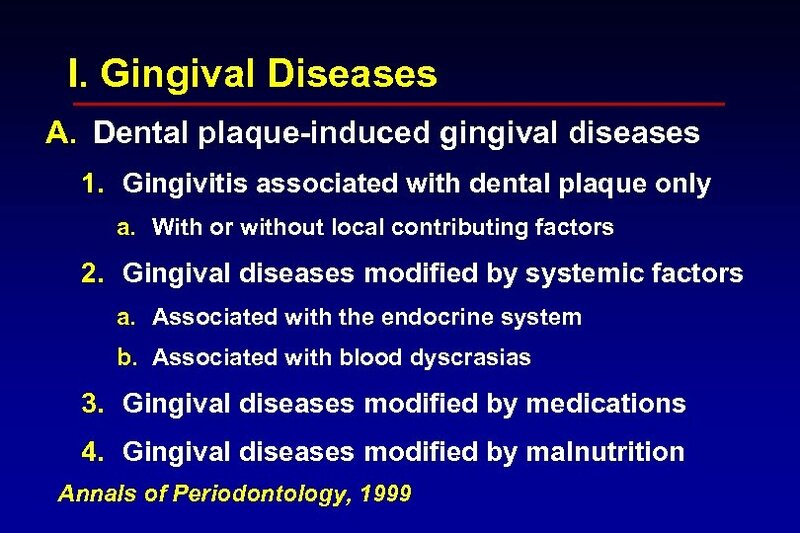 J Clin Periodontol 1998 Mar; 25: 260 -7. 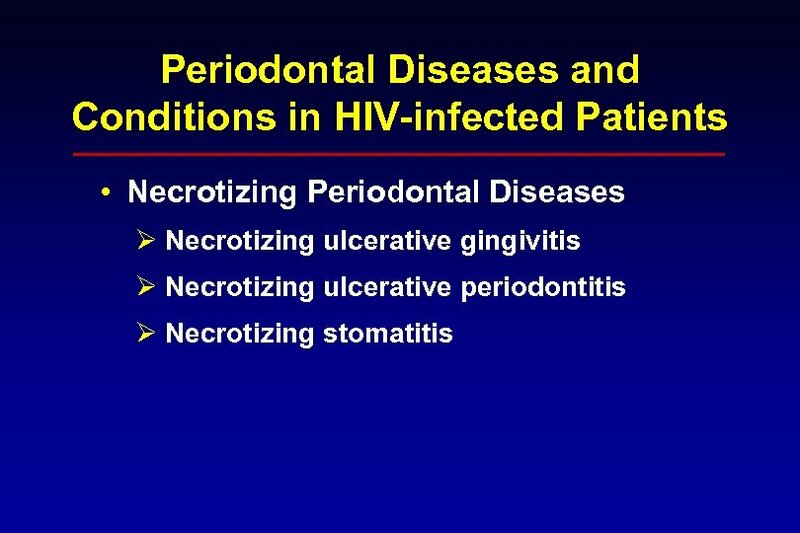 • Robinson PG, Periodontal diseases and HIV infection. 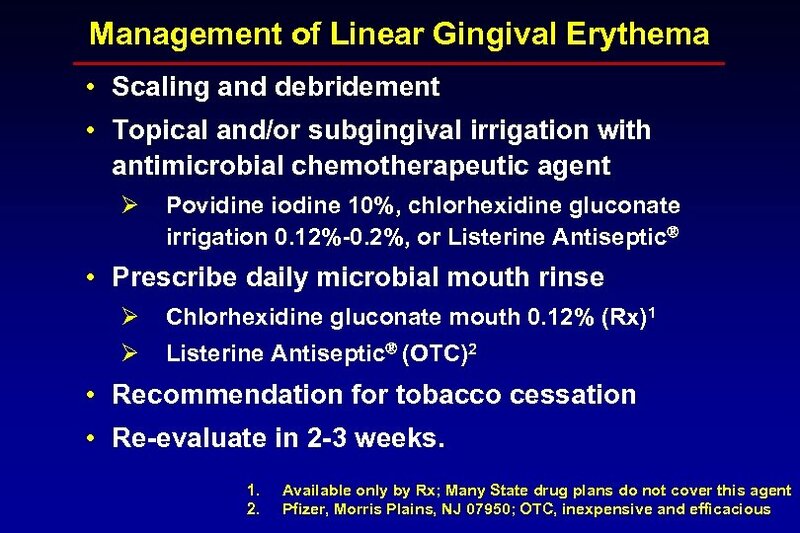 Oral Dis 2002; 8 Suppl 2: 144 -50. • Ryder, MI. 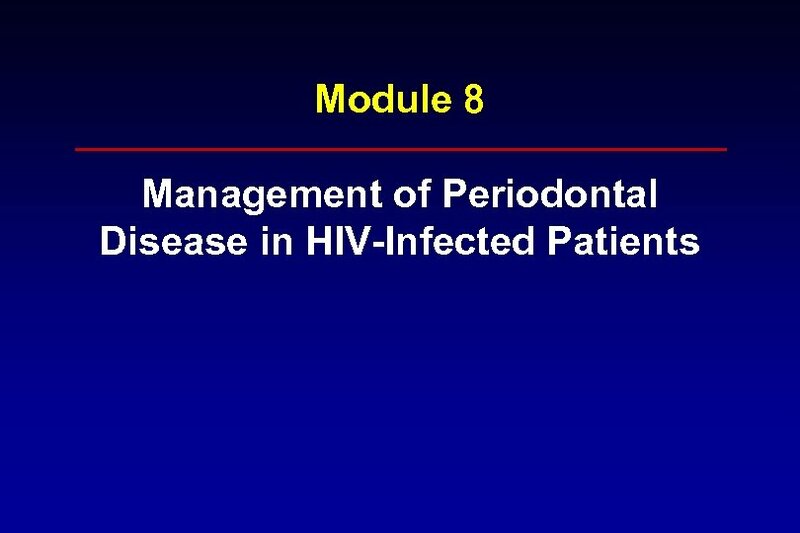 Periodontal management of HIV-infected patients. 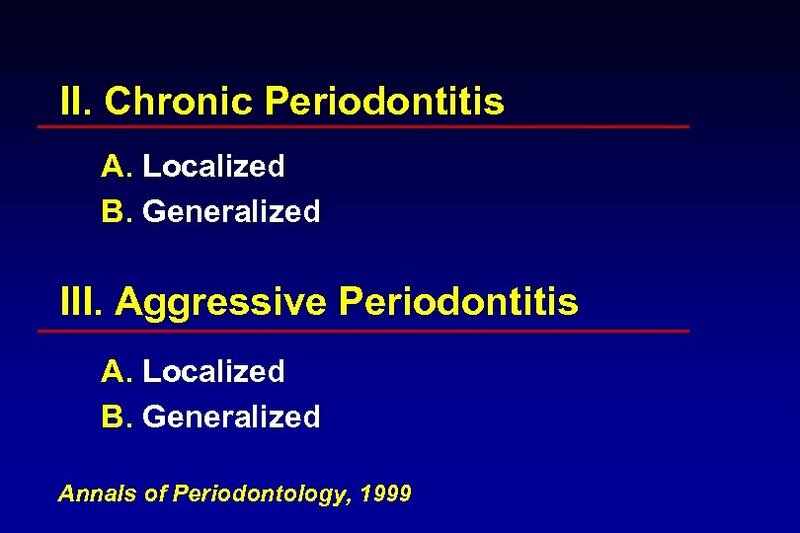 Periodontol 2000, 2000; 23: 85 -93. • Ryder, MI. 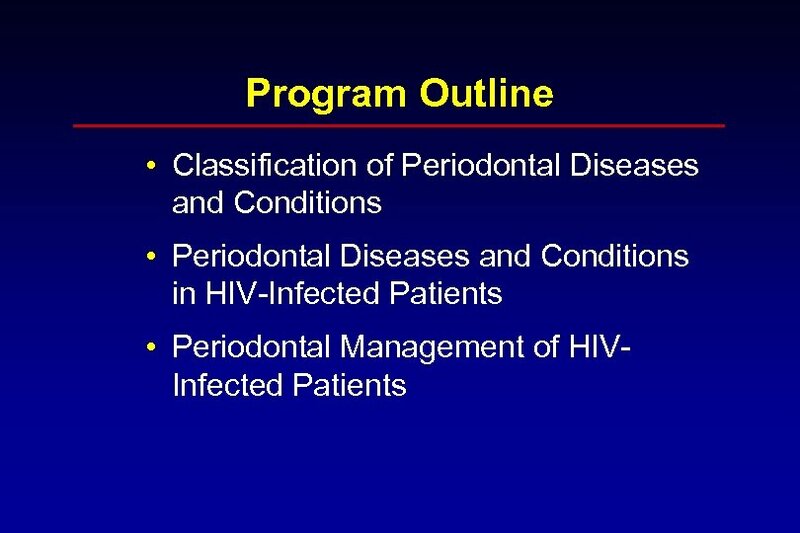 State of the Art: An Update on HIV and Periodontal Disease. 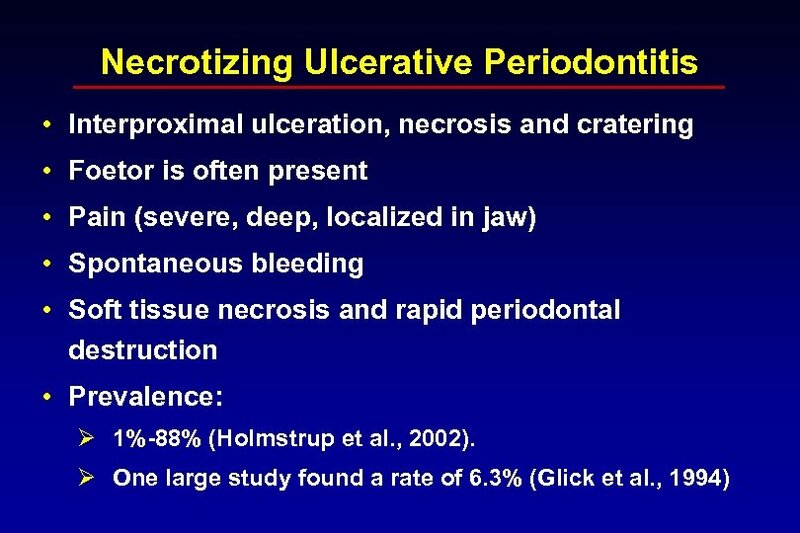 J. Periodontol 2002; 73: 1083 -1090. • Tomar SL, Swango PA, Kleinman DV, Burt BA. 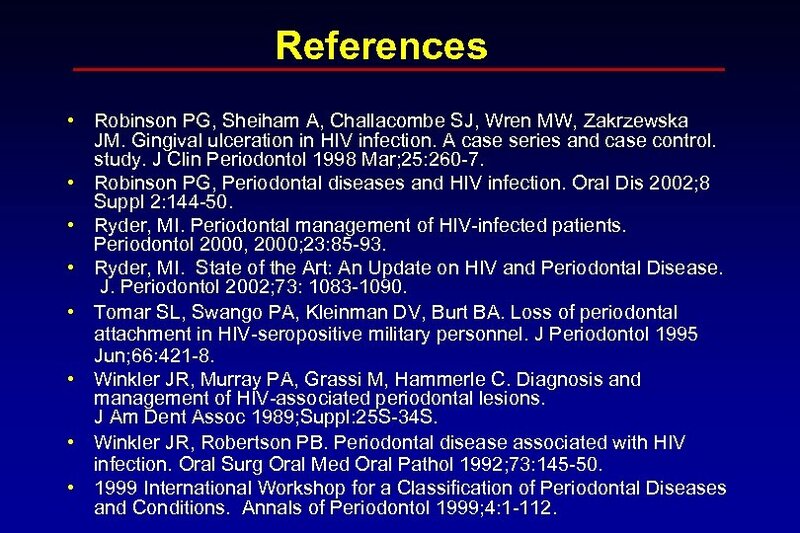 Loss of periodontal attachment in HIV-seropositive military personnel. 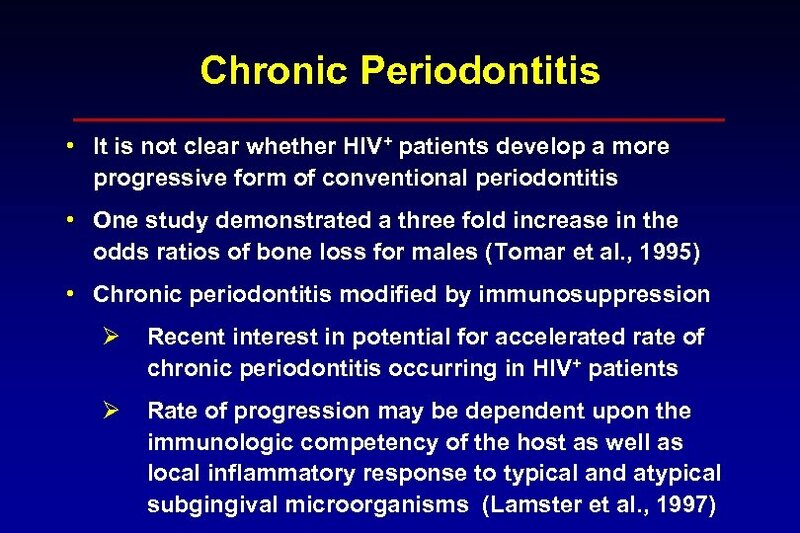 J Periodontol 1995 Jun; 66: 421 -8. 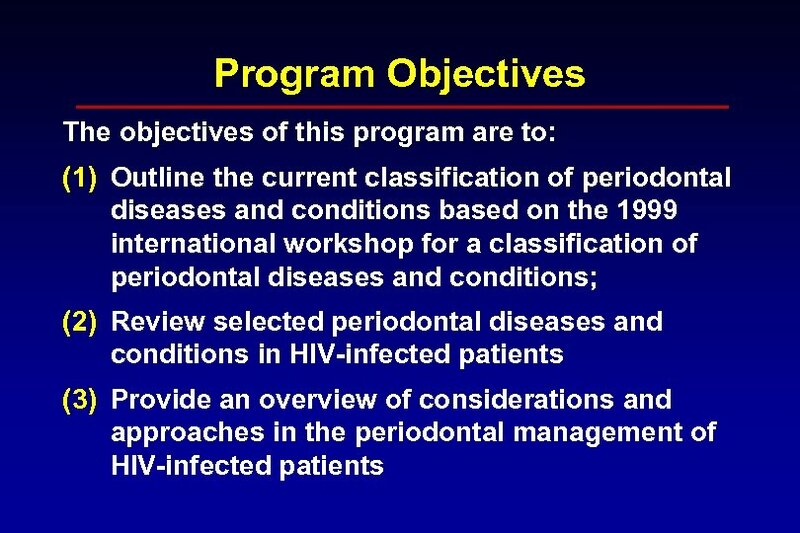 • Winkler JR, Murray PA, Grassi M, Hammerle C. Diagnosis and management of HIV-associated periodontal lesions. J Am Dent Assoc 1989; Suppl: 25 S-34 S. • Winkler JR, Robertson PB. 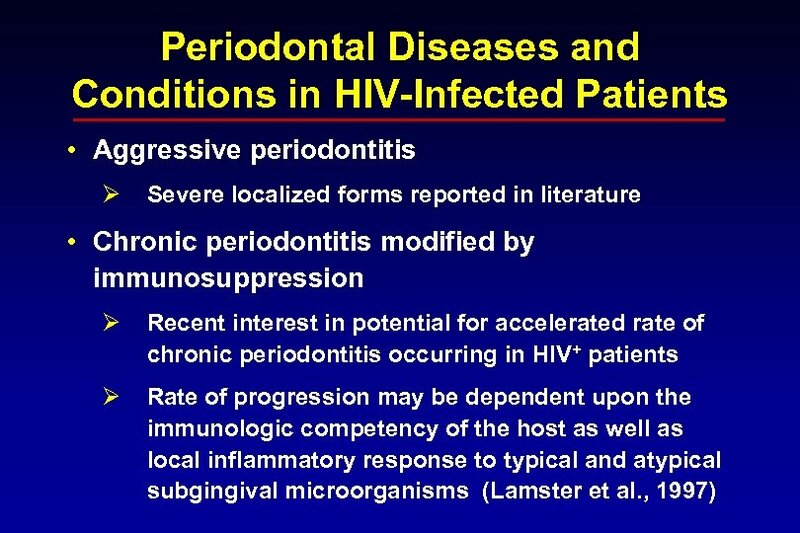 Periodontal disease associated with HIV infection. 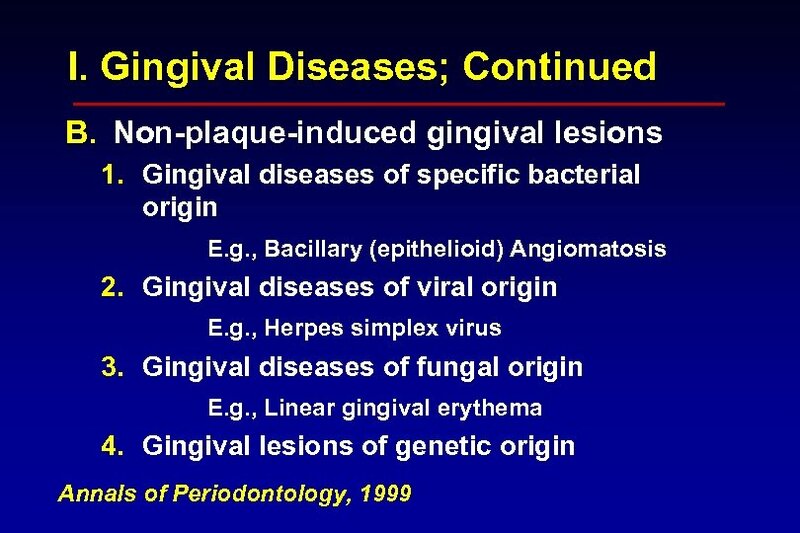 Oral Surg Oral Med Oral Pathol 1992; 73: 145 -50. 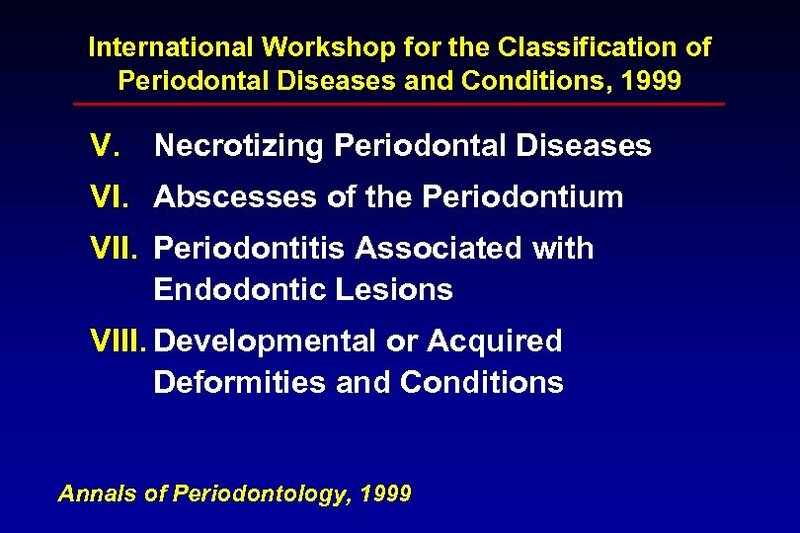 • 1999 International Workshop for a Classification of Periodontal Diseases and Conditions. 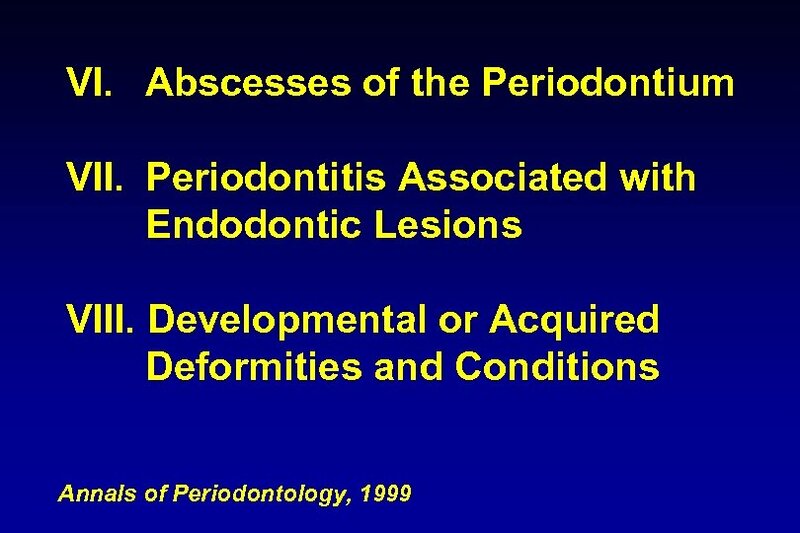 Annals of Periodontol 1999; 4: 1 -112.